The kit lifts the front of the truck 3" and the rear up 1". 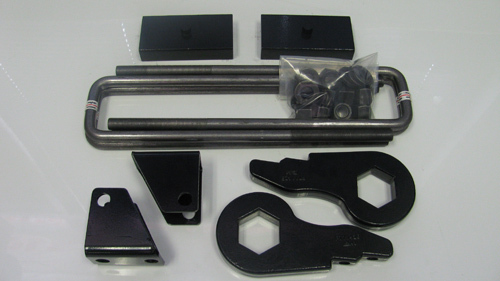 This gives you a lifted look without the hassle and expense of a conventional drop bracket kit. The kit installs in 2-3 hours, doesn't sacrifice the smooth stock ride quality and can be installed with hand tools. We supply a complete kit, with instructions, and dedicated support. NOTE: Dually's can come with different length and/or diameter u-bolts, please measure the length/diameter of your stock u-bolts before you place your order. The customer is solely responsible for ordering the correct u-bolts.